Editor’s note: The above photo was originally given to the New York Post by the FBI as persons of interest. A day later the FBI said they were no longer persons of interest. Photos of Boston bombing suspects sent to Infowars by Anonymous that caused a huge stir on the Internet yesterday after being posted by the Drudge Report have been confirmed by police to be the two men sought for questioning, but the authorities and the media remain mute on other photos which show what are likely to be employees of a private security firm carrying large black backpacks at the scene of the explosion. “In the photos being distributed by law-enforcement officials among themselves, one of the men is carrying a blue duffel bag. The other is wearing a black backpack in the first photo, taken at 10:53 a.m., but it is not visible in the second, taken at 12:30 p.m,” reports the New York Post. The photo is identical to an image we posted yesterday on Infowars.com showing two middle eastern looking individuals, one with a white baseball cap and another wearing a blue jacket. 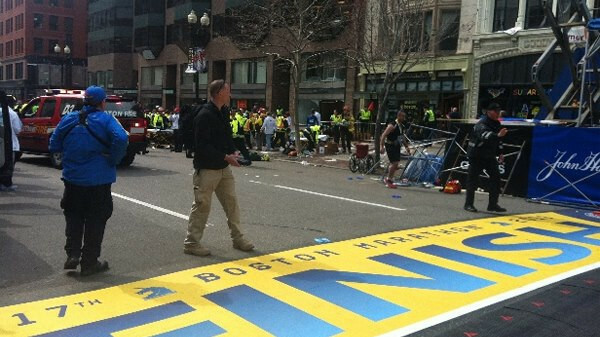 However, there has been no mention whatsoever in official law enforcement or media circles of separate images taken from the finish line of the Boston Marathon which show one Caucasian and another middle eastern looking individual wearing identical clothing, carrying large black backpacks and speaking into cellphones moments after the bombing. As Infowars first highlighted yesterday and as Anthony Gucciardi subsequently confirmed, the two individuals are likely to be employees of Craft International, a Blackwater-style private military/security firm. Police have denied that any such drills took place or that any prior intelligence indicated an attack. The men appear to be wearing Navy Seal attire which is also the same standard issue Craft International uniform used by the private security firm. The media seemed primed to blame the the attacks on white right-wing extremists, but as soon as the photos of the middle eastern looking individuals emerged, reports that an arrest had been made were retracted and the FBI cancelled a planned press conference. The whole official narrative behind the Boston bombings is now in complete disarray as a result of these photos being released yesterday on the Internet. There seems to be no rational explanation for why two employees of a private security firm would be on the scene of the blasts carrying large black backpacks similar to those used in the actual attack unless they were involved in some kind of drill that paralleled the real bombing. The FBI should be attempting to uncover the identity of these individuals as an urgent priority and the mainstream media should be all over the story, but instead we have heard nothing but silence. In addition, following an unscheduled meeting between President Barack Obama and Saudi Foreign Minister Prince Saud al-Faisal yesterday, it was subsequently revealed that one of the early suspects in the bombing, Saudi national Abdul Rahman Ali Alharbi, was being deported from the United States on “national security” grounds. This has prompted some to speculate that the Obama administration is covering up Saudi terrorist involvement in the attack, another reason why yesterday’s supposed unveiling of the bombing suspect was derailed.